Obtaining an MBA degree is about so much more than learning the technical skills most typically associated with MBA students. It is about fostering a mindset and attitude that average simply isn’t good enough. Business school teaches students how to learn, adapt, interact and implement. Prior to entering the post-MBA business world, the best opportunity to showcase the above mentioned skills is at the MBA Games. 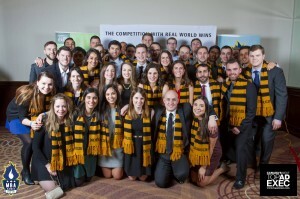 The MBA Games takes place every January and is the largest gathering of MBA students in Canada. 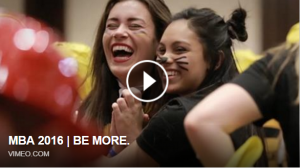 The games are split into three categories: academic, athletic and spirit. Schools build up points in each of the events depending on how well they do. 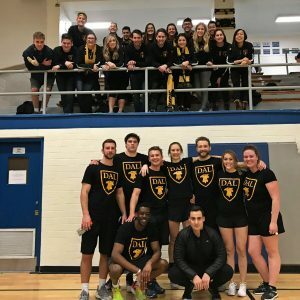 The academic component consists of four case competitions, the athletic component consists of four sports, and the spirit events are everything from a team choreographed dance to charitable fundraisers. This year’s Games were hosted by last year’s winner, The Schulich School of Business at York University from January 2nd-4th. Over 650 students from 20 schools competed in 15 events in hopes of bringing home the Queens Cup. Although a 6th place finish doesn’t come with a trophy, every member of Team Rowe left the Games with more connections, experiences and school spirit than they had going in. Dalhousie pride was on full display from day one as we performed in our east coast fishing hats to the final day as we wore our Dalhousie scarves with pride over our formal wear. Personally, I could not be more proud of the determination, integrity, and competitiveness of each and every one of my teammates. Our small but mighty program rose to the challenge and made a definitive statement that Dalhousie University is a major competitor among Canadians top MBA schools.